Accurate locator – ensures perfect registration everytime. 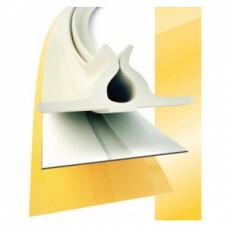 Low profile chamfer – board flows freely over the matrix; board marking is reduced.Fingerlift adhesive – backing paper easily and quickly removed. High tolerance – extremely accurate channel depth and width.Removes cleanly from the plate after use, will not move about during machine run.